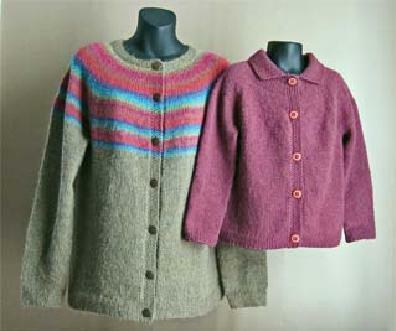 These classic designs have clear, well-written instructions and are suitable for beginning knitters who are ready to go a step beyond plain stockinette or garter stitch patterns. 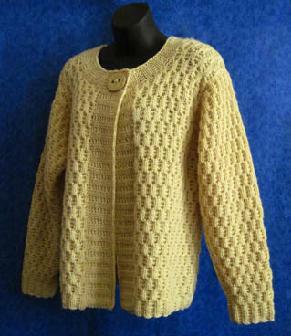 Experienced knitters love them, too as many give you 2 or even 3 patterns in one! Just $5.00 each. 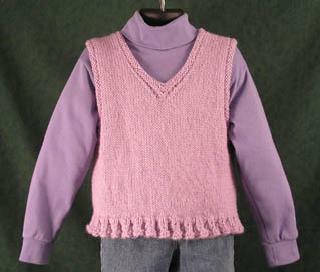 This pretty cardigan features a lovely flower border. 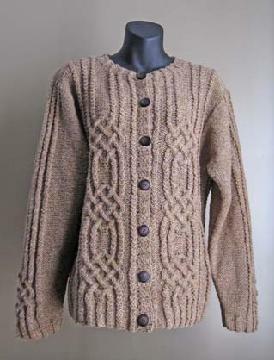 Striking woven cables adorn the front, back and sleeves of this sweater. Worsted weight yarn. 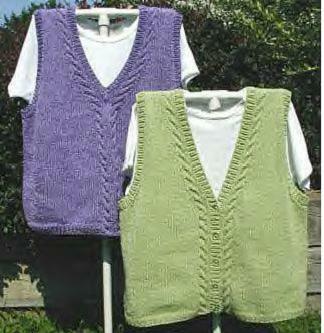 Sized 34" to 54"
Another duo that's great to knit. 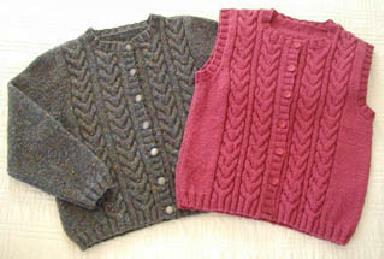 Horseshoe cables to knit adapted to both a cardigan and vest. 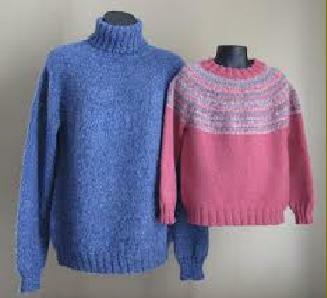 Worsted weight yarn Sizes 36" to 52"
Two patterns for the price of one! 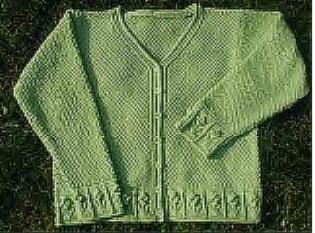 Make a pullover or a cardigan vest with this striking, yet simple cable design. A good choice for a first cable project. Two patterns in one, this has a very pretty cable. Worsted weight yarn. 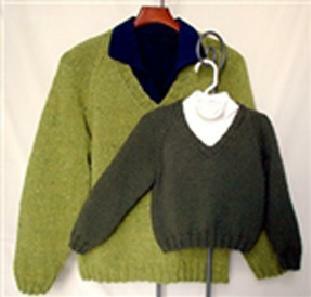 Sizes to 52"
A basic raglancardigan, worked from the bottom up in DK or worsted weight yarn. 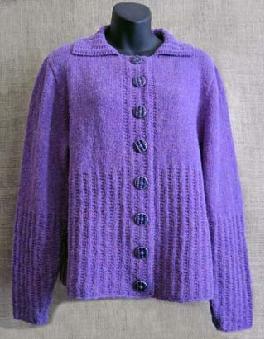 Mirrored cables accent the neck, front and sleeves of this pullover or cardigan sweater. 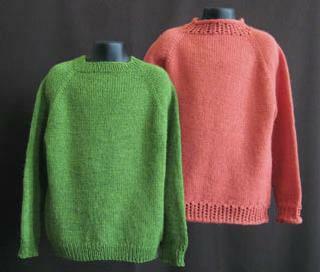 A quick knit in bulky weight yarn. 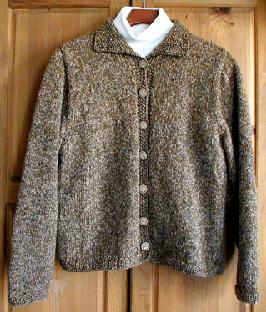 Large bands accent the front of the sweater . 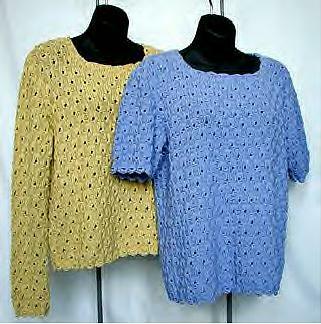 For women up to 57"
Seagull cables on a crew neck sweater in men's and women's sizes. Heavy worsted weight yarn. 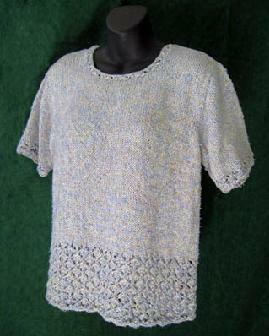 Lace sweater in two sleeve lengths, edged with a loop pattern. 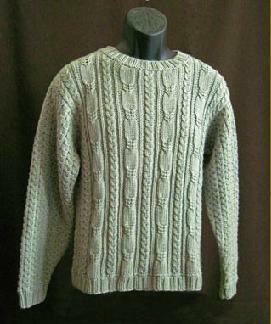 Sizes 34" - 52.5"
A great pattern for him, this gansey style pullover, is worked in worsted weight yarn. 12 sizes, finished chest: (22, 24, 26, 28, 30, 32) [34, 38, 42, 46, 50, 54]"
Seed stitch edgings and collar Sizes to 52"
This lace pattern uses DK weight yarn. 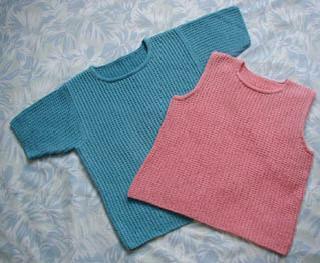 Long or short sleeve, V or round neck. 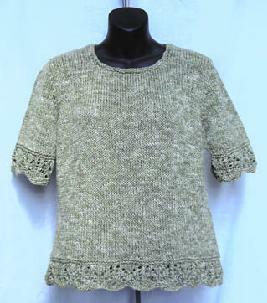 Worked in Aran weight yarn, this sweater has a pretty lotus flower border and sleeve cuff. 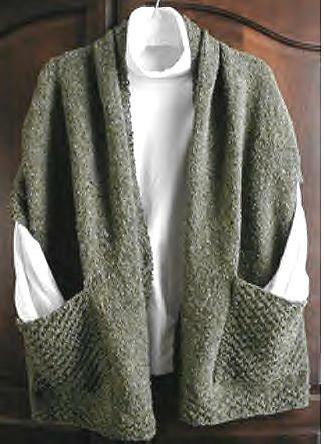 Written for 6 sizes with chest measurement from 33.5" to 55.5"
Lacy Trellis borders worked in worsted or aran weight yarn. 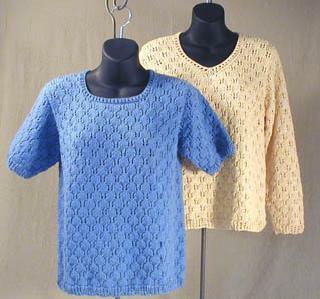 Sized 35, 38, 43, 46, 51, 54"
A basic top-down raglan worked in worsted weight yarn with your choice of ribbed or lace edging. Great pattern for beginners, too. This T Top and Shell pair is sized from 36" to 56"
Ruffled brim hat in four sizes. 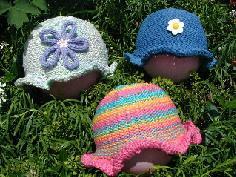 You can decorate this cute ruffled hat any way you like with buttons, bows or flowers. 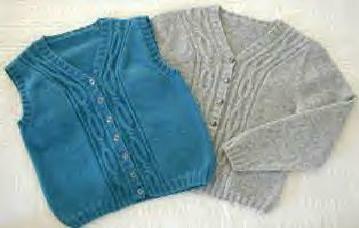 offers you the option of a neckband or a collar. 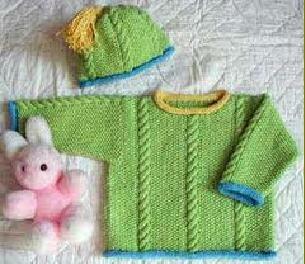 Sizes newborn - 24 months. 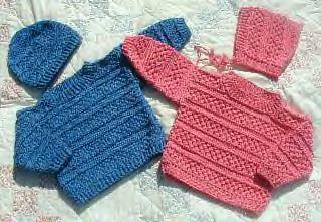 Star stitch pattern for boys, Lacy Star pattern for girls. A quick and easy stockinette knit with a cute ruffle at the bottom. Great as a summer tank, too! Worsted or DK yarn. 6 sizes Chest measurements 24 " to 34"